I finished piecing my 'Single boy' quilt the other day and basted it in preparation for some intensive circular quilting. From the start of your machine quilting process ensure you frequently adjust your quilt so you are actually going around smoothly. It helps if you keep your needle in the down position so the quilt doesn't move. Don't force the quilt around, instead sew 10 stiches or so, stop, adjust quilt, sew again 10 stitches and so forth. This will go on like this for a few rounds and soon you realize that you can stitch longer without having to adjust the quilt quite as often as the circle has grown larger. At the point where the chalk circle has finished (the outer tale so to say) use either the edges of your walking foot as a guide or the guide tool that comes usually with it. It depends on how far apart you want your circle stitch lines. For this quilt I am choosing the edges of my walking foot as I want dense quilting. 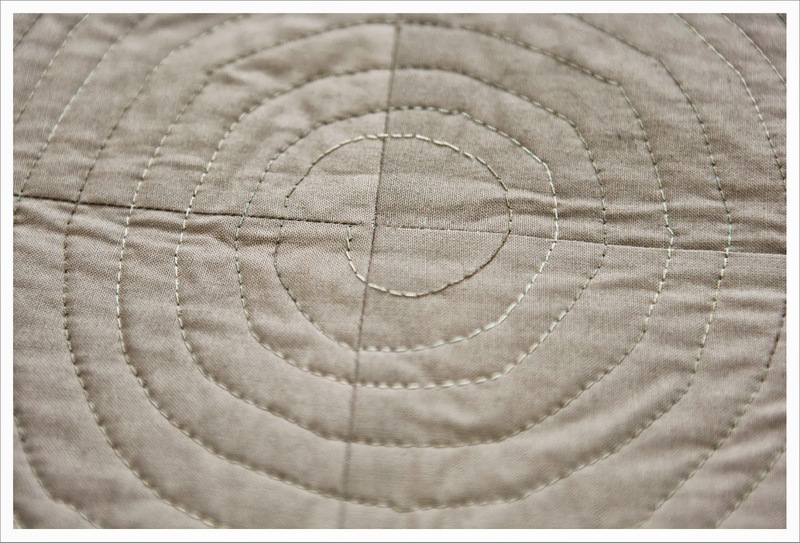 The first 10 rounds of circular quilting are still awkward even if you do the tale by hand. I generally don't worry about this. None oft the circular quilting I have done is 100 % circular at first. There are always a few jagged lines. This is after all a handmade object and not quilted by a programmed machine. Circular quilting requires a VERY well basted quilt as the constant movement through the machine puts a lot of strain on the quilt. You can also start the quilting by using a darning foot or free motion foot if you don't wish to do the hand stitching. But I only recommend this for quilters who are actually familiar with free-motion quilting as this will otherwise go horribly wrong. Once you have done the first few rounds you an switch to the straight stitch walking foot. This quilt is really wonderful, I want to make one too. 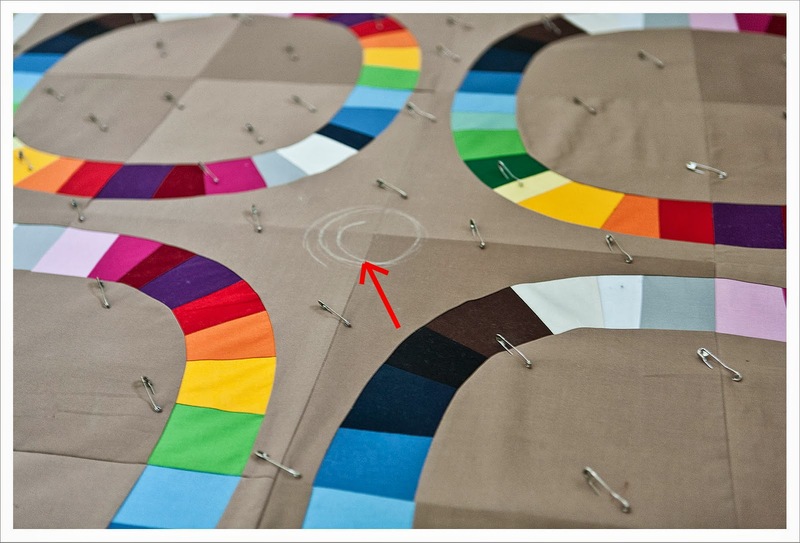 Thank you for the explanation of your circular quilting approach, I will try marking like you have next time I do it. Great idea! I'd be doing the FMQ thing in the middle!